In the vibrant neighborhood around 16th Street and Guerrero, a new Italian restaurant is taking shape. As opening day draws closer, construction continues around the clock. Come by and you may hear the squeal of the electric saw, the clattering of lumber, the whine of an electric drill. But, despite the fact that several people are conversing simultaneously, one noise that’s notably absent is the sound of voices. That’s because the conversations are all in sign language. 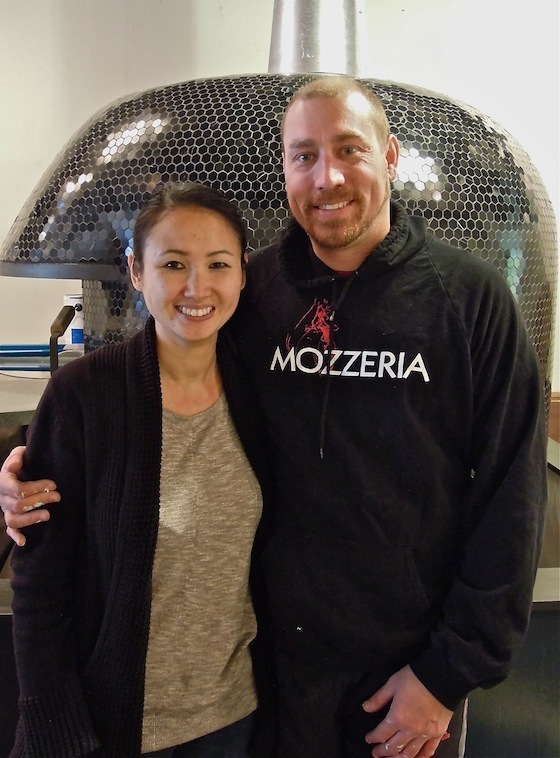 The owners and operators of Mozzeria, Melody and Russell Stein, and many of their workers are deaf. For this food writer—whose other job as a sign language interpreter has given her the gift of another language and a window into a fascinating culture—this is the dream interview. As I visit with Melody and Russ, we effortlessly chat in ASL (American Sign Language). Make no mistake, however, the Steins are designing their restaurant and menu for the general public. And Melody has done her homework: besides studying Hospitality Management, she did a tour of Italy in 2010, taking cooking classes in several Italian cities to hone her recipes and perfect her pizza technique. Melody also draws on support and inspiration from her father, who ran two successful restaurants in Hong Kong, where she was born. When her parents realized that Melody and her younger brother were both deaf, they began a search for the best school for their children. After short stints in deaf schools in the Philippines and Singapore, the whole family relocated to Northern California, where Melody and her brother attended CSD (California School for the Deaf in Fremont) and her father opened another branch of his Wu Kong restaurant in San Francisco’s Rincon Center. Actually, Russ is the reason behind the pizza. Growing up in a large deaf family in New York City, Russ has always been a pizza addict, devouring cheesy slices almost every day. Melody and Russ met when they were both studying Business Administration at Gallaudet University in Washington D.C. (the world’s only university specifically designed for deaf people). Of course, only the world’s best pizza would satisfy this pizza gourmet and that’s why Mozzeria will be serving Neapolitan style pizza made in their new 5,000 pound Stefano Ferrara wood-burning oven, imported from Italy. Russ will use almond, oak or apple wood to feed the shiny black-tiled mountain that dominates the dining room of their cozy 49-seat space. As for the rest of the décor, Melody uses the vivid economy of ASL signs to paint a quick picture of the kind of Italian restaurant this is NOT going to be. She deftly describes a red-and-white-checkered tablecloth and old wine bottle overflowing with colored wax drippings, then gently shakes her head as she smiles sweetly. Instead, Melody envisions a combination of modern and vintage styles. The vintage is inherently part of this historic 1908 building and is stunningly represented in the 100 year old hardwood floor they were thrilled to discover hiding under grungy old tile. As is the custom in collectivist Deaf Culture, the Steins looked first for deaf artisans or laborers to fill their needs and found Michael E. Sharnov and Samuel Reynolds, deaf wood refinishers who brought out the warm luster in the dark brown Douglas fir floor. They also hired Nathan Dingel, a deaf electrician and HVAC professional who was Melody’s classmate at CSD and Ron Trumble, a deaf woodworker, to design and make their door, tables, shelves, banquette seating and a counter topped with marble. 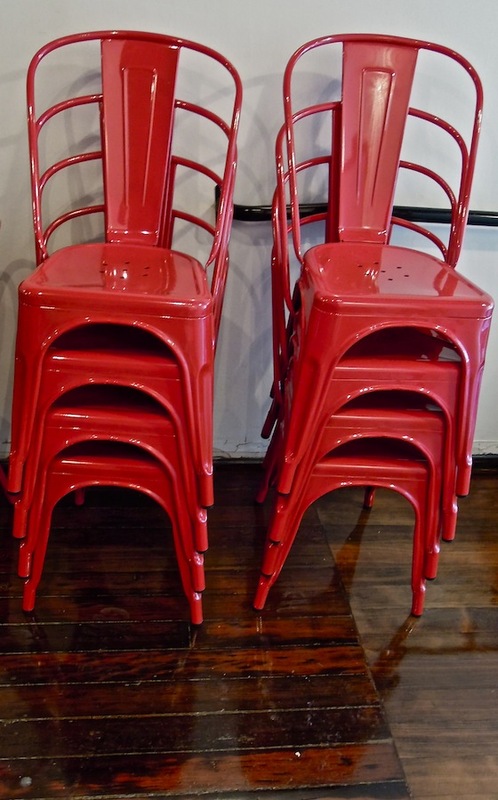 Interior designer, Patty Foo Hampton, who has deaf parents, created a stark black and white color scheme, set off by shiny red chairs that are sitting in patient stacks, waiting for opening night, which is planned for December 9. As for the menu, Melody is keeping some surprises up her sleeve until the big day. 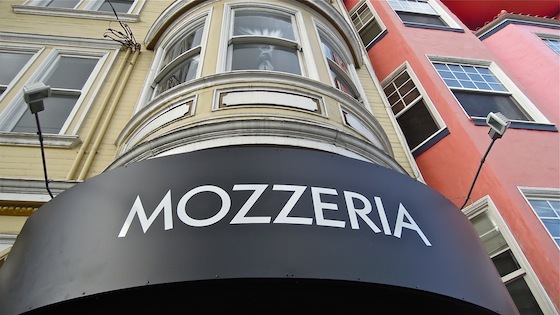 She does say that Mozzeria will feature “traditional and non-traditional pizzas to celebrate San Francisco’s cultural diversity.” Pasta and inventive small plates (developed by lead cook Justin Belluomini) will be served with local beer on tap, Californian and Italian wine and vintage sodas. Their wood fired oven will reach a temperature of 1000 degrees and bake pizzas to crispy, melty goodness in a flash—60-90 seconds. Dinner will be offered Tuesday-Sunday nights with addition of brunch on the weekends. “There are only a handful of deaf owned restaurants around the country, “ says Russell proudly, “ We are the first one in a major city—and a famous food city too.” Although, the Steins expect that most of their customers will be “hearing” (the ASL term for those who are not deaf), they want to make sure their deaf supporters, many of whom have been cheering on Mozzeria’s progress over the past year on their blog, are comfortable too. Lighting is the most important component for deaf diners and Russ says that Mozzeria will have plenty of lighting. Melody adds that dim interiors make her eyes tired and teases that candle-lit tables could be dangerous during an emphatically signed exchange. Their big screen TV will have its captions on permanently, emergency lights will be strobe-enabled and flashing light signals will alert them when the phone rings or someone is at the door. Customers can make reservations online using Open Table and the restaurant is also equipped with a videophone which hearing customers can access through a video-relay service. For updates and to check opening date, go to mozzeria.com.